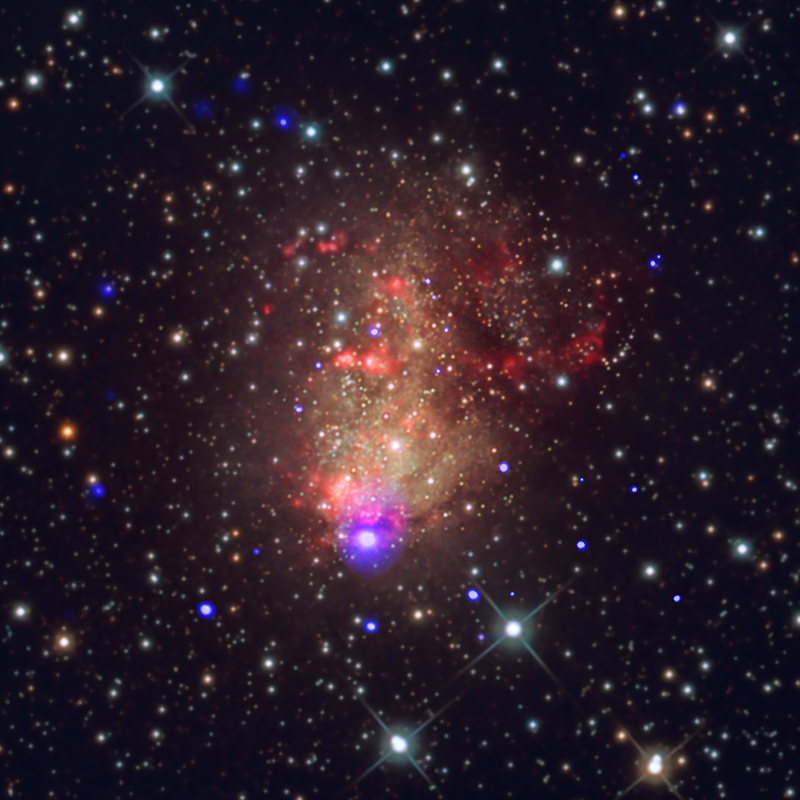 Chandra observations of the IC 10 starburst galaxy reveal about 110 X-ray sources. Of these, about a dozen are systems where a black hole or neutron star is pulling material away from a young, massive companion star. Some of these pairs may eventually form systems that merge and emit gravitational waves. This new composite contains X-rays from Chandra (dark blue) combined with an optical image from an astrophotographer (red, green, blue). By analyzing Chandra observations of IC 10 spanning a decade, astronomers found over a dozen black holes and neutron stars feeding off gas from young, massive stellar companions. 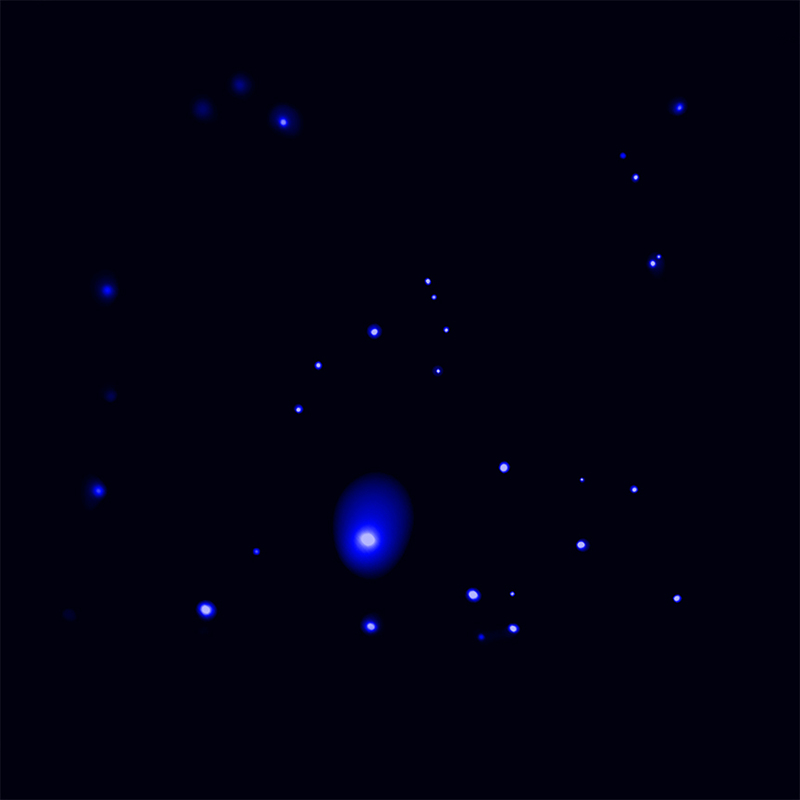 Such double star systems are known as "X-ray binaries" because they emit large amounts of X-ray light. As a massive star orbits around its compact companion, either a black hole or neutron star, material can be pulled away from the giant star to form a disk of material around the compact object. Frictional forces heat the infalling material to millions of degrees, producing a bright X-ray source. When the massive companion star runs out of fuel, it will undergo a catastrophic collapse that will produce a supernova explosion, and leave behind a black hole or neutron star. The end result is two compact objects: either a pair of black holes, a pair of neutron stars, or a black hole and neutron star. If the separation between the compact objects becomes small enough as time passes, they will produce gravitational waves. Over time, the size of their orbit will shrink until they merge. LIGO has found three examples of black hole pairs merging in this way in the past two years. Starburst galaxies like IC 10 are excellent places to search for X-ray binaries because they are churning out stars rapidly. Many of these newly born stars will be pairs of young and massive stars. The most massive of the pair will evolve more quickly and leave behind a black hole or a neutron star partnered with the remaining massive star. If the separation of the stars is small enough, an X-ray binary system will be produced. Chandra detected 110 X-ray sources in IC 10. Of these, over forty are also seen in optical light and 16 of these contain "blue supergiants", which are the type of young, massive, hot stars described earlier. Most of the other sources are X-ray binaries containing less massive stars. Several of the objects show strong variability in their X-ray output, indicative of violent interactions between the compact stars and their companions. A pair of papers describing these results were published in the February 10th, 2017 issue of The Astrophysical Journal and are available online here and here. The authors of the study are Silas Laycock from the UMass Lowell's Center for Space Science and Technology (UML); Rigel Capallo, a graduate student at UML; Dimitris Christodoulou from UML; Benjamin Williams from the University of Washington in Seattle; Breanna Binder from the California State Polytechnic University in Pomona; and, Andrea Prestwich from the Harvard-Smithsonian Center for Astrophysics in Cambridge, Mass. Coordinates (J2000) RA 00h 20m 23.2s | Dec 59° 17´ 34.7"
About 2.2 million light years from Earth. Combines X-rays from Chandra X-ray Observatory and optical light from another telescope. About 10.3 arcminutes (6,500 light years) on a side.